Your patients don’t use phones or tablets to search for information about hearing loss or to find audiology practices. Right? Many audiologists assume that people over the age of 60 don’t use mobile devices for anything except phone calls and texting. If prospective patients aren’t using mobile devices to search online, why worry about having a mobile-friendly website? Whoops. That’s a huge misconception. A recent Pew Research Center report found that, although this demographic doesn’t use mobile devices at the same level as younger demographic groups yet, searches on mobile devices by seniors, at 59%, is climbing at the same dizzyingly fast pace as the general adult population, now at 86%. A second Pew Research Center report found that seniors using mobile devices have a far more positive impression of using those devices to accomplish essential tasks like scheduling appointments than younger demographic groups. 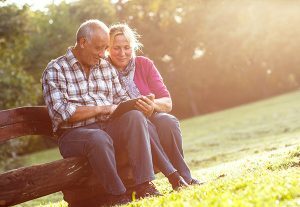 Seniors are using mobile devices more and more, so why aren’t more audiology websites mobile friendly? Of course, it’s not only seniors who need audiology services. We don’t have to tell you that 15 percent of school age children aged 6 to 19 have some level of hearing loss requiring audiology care. They and their parents are within the heavy mobile device usage demographic and expect to be able to visit your website from their mobile device and easily get the information they need. That word easily is key. If your site isn’t optimized for mobile, it will be hard for people to read and clumsy to navigate at small screen sizes. Your prospective patients will simply click away — to one of your competitor’s sites! fill out your contact form. Look at your audiology website on your smartphone. Can your potential patients — especially seniors — navigate and read your site without problems? Are they clearly prompted to take action and call your practice? Notice how long it takes to load your website. Old desktop-centric websites load slowly on mobile devices. If it takes longer than 2 seconds to load, half of your potential patients leave. A mobile-friendly website helps maximize your patient conversion rates by eliminating all these patient turn-offs. When a potential patient searches for audiologists in your town, Google will place mobile-friendly audiology websites higher in the search results than desktop-only sites. In other words, their search algorithms highly favor mobile friendly sites. Why? Google and the other search engines have certainly noticed that seniors are using mobile devices more and more, along with everyone else. They’re favoring audiology websites that make that a seamless and positive experience. If your site isn’t mobile friendly, you’re losing patients to the competition. Check your site with Google’s mobile-friendly test here. Don’t believe the lie that you don’t need a mobile friendly medical website. To get more patients to call you and schedule appointments via your website, you must have a website that works for them. MedPB specializes in mobile friendly, responsive websites that get patients calling. Talk with us today about how to fill up your patient schedule faster!